The term ‘Jones fracture’ is used inconsistently; some referring to fracture at the metaphyseal-diaphyseal junction and others define it as a fracture at the proximal diaphysis. The ‘Zone I, II, III‘ method of description is more accurate, replicable and assists in determining immediate treatment and ongoing management. 1960 – Stewart differentiated an avulsion fracture of the tuberosity / styloid from fractures of the proximal diaphysis. He named the latter: ‘Jones fracture’. 1984 – Torg et al report fractures of proximal diaphysis are likely located at a site of pre-existing stress pressure. Zone 1: Tuberosity avulsion fracture, with or without involvement of the tarsometatarsal articulation. Caused by forces by the peroneus brevis tendon or the lateral band of the plantar fascia during foot inversion. 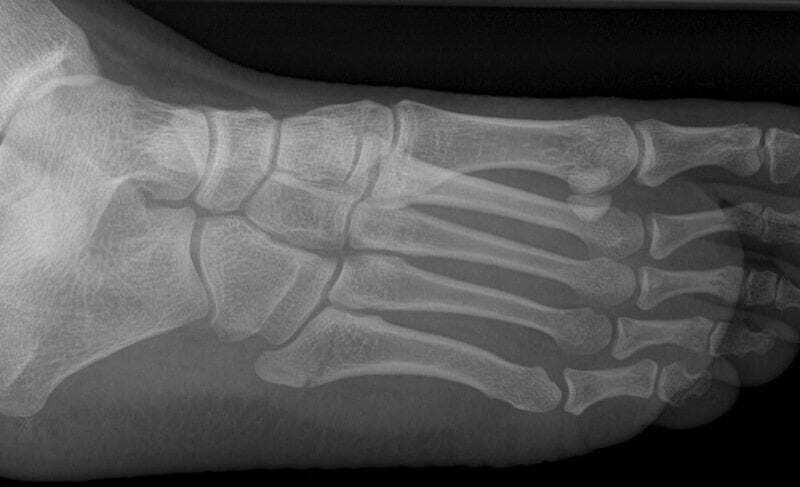 Zone 2: Jones fracture; metaphysis-diaphysis junction fracture, which extend into the fourth-fifth intermetatarsal facet. Caused by forced forefoot adduction with the hindfoot in plantar flexion. Torg JS. Fractures of the base of the fifth metatarsal distal to the tuberosity. Orthopedics. 1990;13(7):731–7. [PMID 2197611].